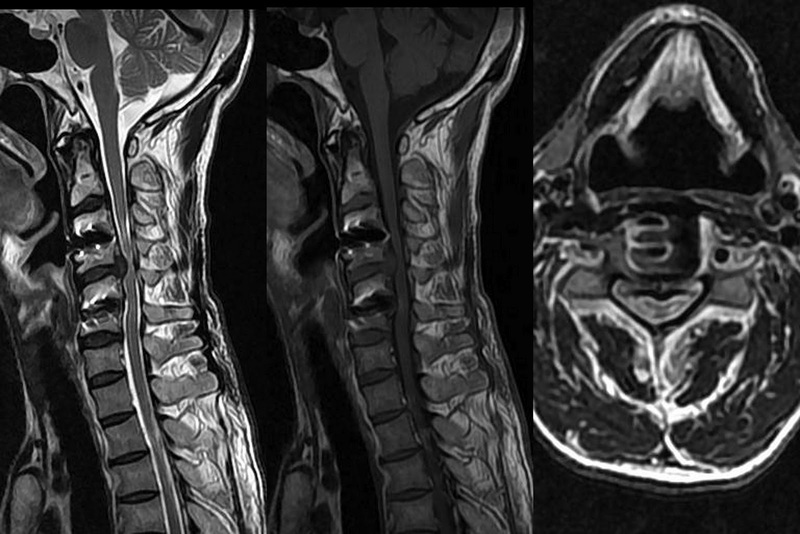 MRI Cervical region spine Sagittal T1, Sagittal T2 with Axial T2w image : E/o Anterior cervical discetomy at C3-4 and C5-6 with susceptibly artefact due to cage implanted in the disc space for interbody fusion. At C4-5 disc show posterior protrusion with significant cord compression. Anterior cervical discectomy (ACD) is an effective and safe approach for nerve root or spinal cord compression caused by disc herniation, allows direct visualization of the entire inter space and wide decompression of the anterior aspect cervical spinal cord and nerve roots. It may be undertaken in cases of multilevel disease and interbody fusion may be performed if required on the same setting. 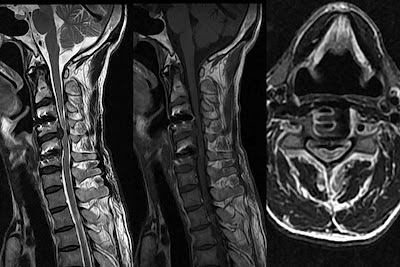 Cervical inter body fusion after discectomy needed for preservation of the physiological lordosis and stability of the cervical spine. Fusion rates decrease significantly when more than one level undergoes surgery so some authors recommended the addition of a plate system to improve results in past. In newer studies, cages are used for inter body fusion, the disc cages have a load-sharing function and stabilize the spine to increase segmental stiffness, thus achieving fusion rates similar to those associated with bone grafts, even in multilevel disease. Interbody fusion cages are hollow metal implants that restore physiological disc height, allowing bone growth within and around them, thus stimulating bone fusion. In anterior cervical discectomy, an incision is made in the front of the neck which allows the surgeon to remove the damaged and protruding disc and associated bone spurs in order to relieve any pressure on the spinal cord and nerve roots. After the disc is removed, the gap that has been created between the two bones is then typically filled with a piece of bone graft (obtained from a cadaver or from the patient’s pelvis) or with a titanium cage device. The goal of the procedure is with preservation of height of disc space and to cause the two bones to grow and fusion together resulting in a complete loss of motion at the surgical level. Subsidence of disc cage into the adjacent VBs, cage dislocation, nonunion-related instability, and painful pseudarthrosis. Patients who have metallic devices implanted in spine like pedicle screws or disc cages can have MRI scan done, but the image quality and information often hampered due to susceptibility artifact by the metal device. Artifact is much more of a problem if stainless steel implants are used for the fusion. Recently, titanium implants have been used for most fusions and stainless steel has almost out dated in most of the institution for the sake of follow up post operative MRI study.